He put the stress on ‘brave’ as if there might have been another Ulysses around who had less of an appetite for man-to-man combat. We were on Kefalonia, the sixth largest of the Greek islands, which sits between Ithaca and Zakynthos – far to the south of Corfu. 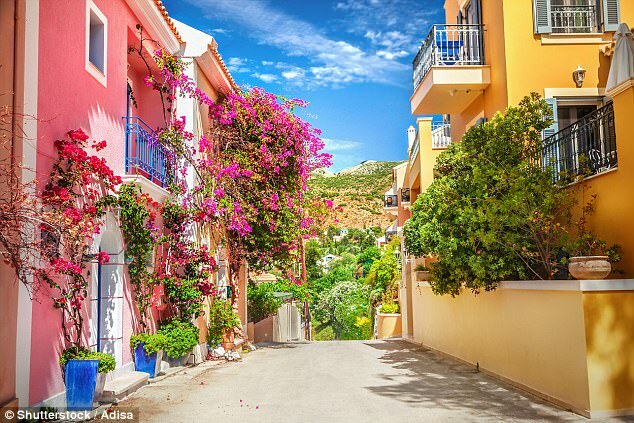 Unlike Corfu and other tourist-savvy islands such as Rhodes and Crete, Kefalonia still has the look of a place surprised to find itself in the holiday business. If Ithaca has Ulysses, Kefalonia has heroes of a more recent vintage. The island was the setting for Louis de Bernières modern classic Captain Corelli’s Mandolin. And, surprisingly – as Hollywood almost never seems to shoot films in their authentic setting – this was where Penelope Cruz, Nicolas Cage and Christian Bale came to star in the film of the book when it was made here in 2001. The locals are ambivalent about the film as it makes narrative capital out of the two worst events to affect the island in living memory. The ill-fated occupation by the Germans during the Second World War (which resulted in the massacre of more than 5,000 Italian troops as portrayed in Captain Corelli’s Mandolin); and the terrible earthquake which destroyed large parts of the island in August 1953, killing 600 people and making thousands homeless. Driving across the island today, however, there is little to suggest recent troubles. Kefalonia radiates a quiet contentment, perfect for someone who has arrived, like us, searching for utter peace and quiet. Thomas Cook’s Manos features traditional, family-run hotels and self-catering places it describes as ‘perfect for couples’. I think what it’s quietly pointing out is that Kefalonia has wisely turned its back on the clubbing scene – eschewing the bar-crawling crowd who have disfigured so many other once-glorious Greek islands (such as neighbouring Zakynthos). 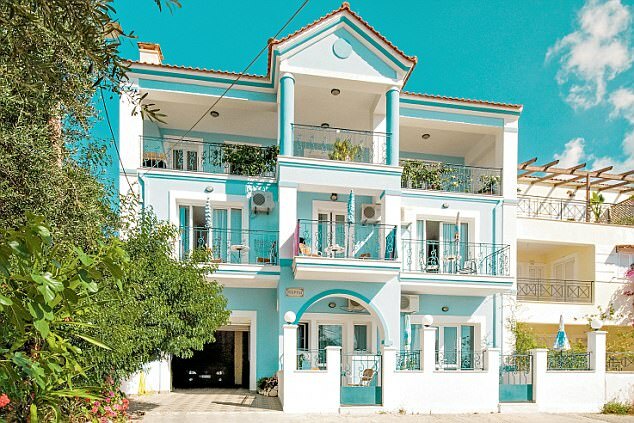 It wasn’t hard to settle on the Myrto self-catering apartments in the village of Agia Efimia, a traditional fishing village on the east coast of the island. From the start it was clear this property suited us down to the ground. Situated slightly up a hill it offered glorious sea views and it was just a few minutes’ walk from an excellent beach. What quickly endeared us to Kefalonia was that this was a ‘real’ place where the locals clearly have a life beyond tourism. 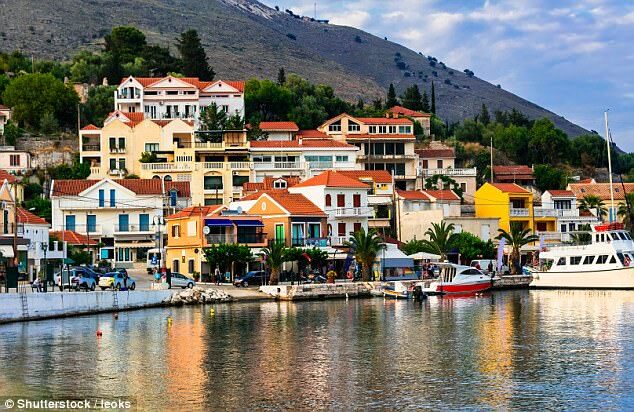 The capital, Argostoli, for example, is charming, with a substantial fruit market near the harbour. Of particular interest in the harbour are the turtles, who have become something of a tourist attraction. Another endearing factor is that there are few ‘must-see’ sights. Our only outing was to take a drive round the island to the harbour town of Fiskardo 30 miles north of Argostoli. 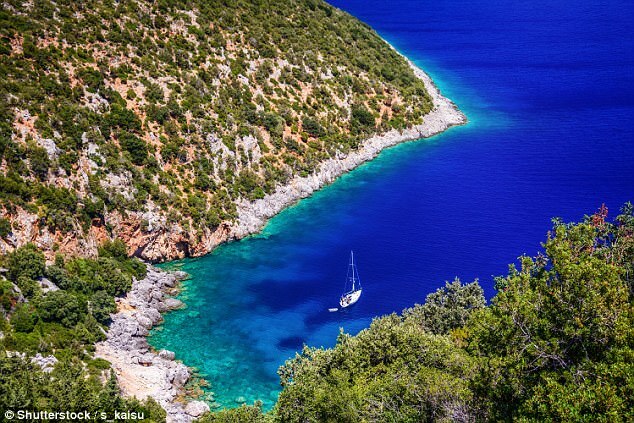 If you were given a pen and paper and asked to design the perfect Greek fishing village, you would end with Fiskardo. It has become popular with the rich and famous as the perfect place to tie up their luxury yachts as they make their way around the Mediterranean. We had a fabulous lunch at a harbourside restaurant where our waiter confided that Tom Hanks and his wife were on a yacht nearby and were expected to arrive for lunch imminently. We strung out dessert as long as we possibly could, but Mr Hanks didn’t put in an appearance (or perhaps he is so good at disguises that we didn’t recognise him). Fiskardo is one of the few villages on Kefalonia that were left undamaged by the 1953 earthquake: its handsome Venetian buildings are an impressive sight. 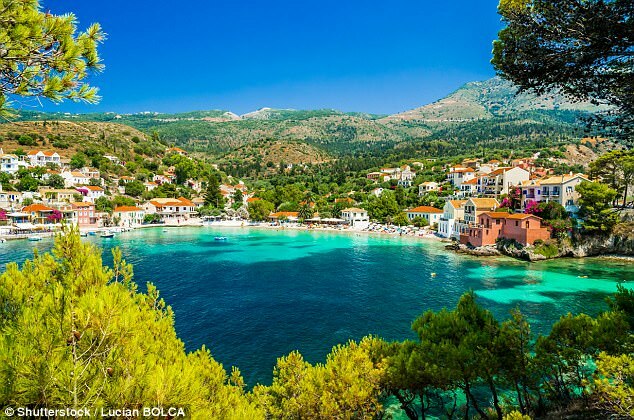 What was also impressive is that while the place is probably the nearest thing that Kefalonia has to a major resort, it didn’t really feel like a tourist honey pot – it certainly wasn’t crowded. And, best of all perhaps, the excellent meal was very reasonably priced. The island has only recently begun seeking to attract tourists and doesn’t seem to have been alerted to the possibilities of ripping off visitors. If you come here in the height of summer, you have to be aware that the heat can be terrific. We took our trip to Fiskardo in the evening when the heat was tempered by a cooling breeze from the sea. For most of the time we stayed close to our apartment. 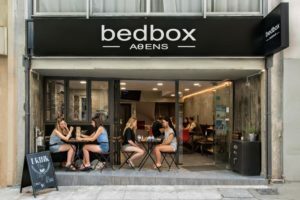 There were plenty of good tavernas and bars where we could enjoy a reasonably priced meal in the evening; breakfast and lunch we were happy to make for ourselves in the apartment.